In the wake of the loss of Steve Jobs, I can't help but be reminded that more research and attention is necessary to rid our world of cancer. Many of us have personally been effected by the loss caused by cancer and we need to work together to come up with a cure. There are a lot of ways we can help, volunteering our time, fundraising, raising awareness, and I hope that working together we can prevent the tragedies of this disease. I can across the signature cuff below on Lovely Bride, proceeds go to a great cause and it's beautifully designed. October is Breast Cancer Awareness month, and artist Melissa Joy Manning has partnered with Greenwich Jewelers to design and sell a signature cuff. 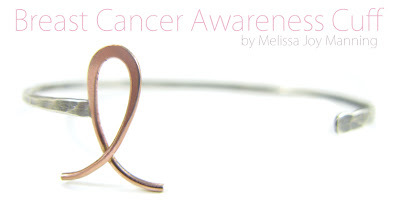 Both Melissa and Greenwich Jewelers will be donating the profits to their respective research foundations, BCRF and Susan G. Komen. If you know of any other great fundraisers or ways to contribute I'd love to hear about them, comment here or shoot me an email.